A CHINREST THAT SUITS YOU! 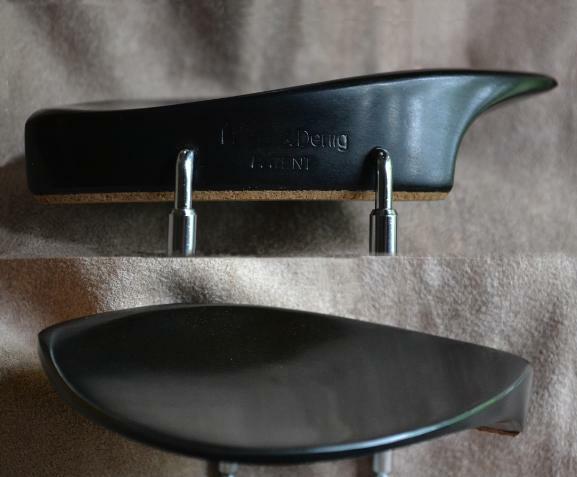 Just as shoes must be fitted to the individual according to foot contour and length for walking comfort, so must chinrests be fitted to each player according to jaw shape and neck height for long-term playing comfort. 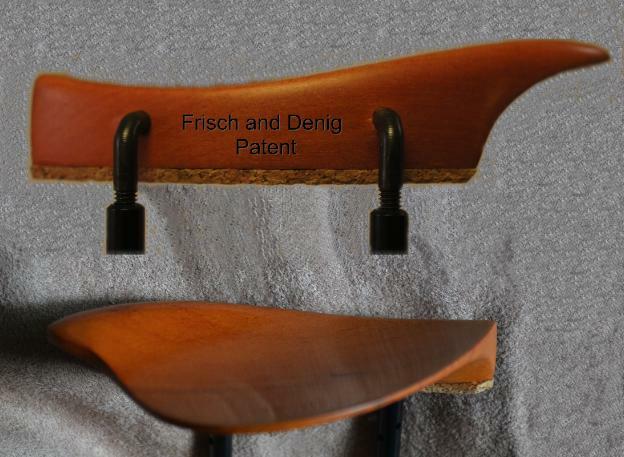 The Frisch and Denig patented Fitting Process, Fitting Kits, and chinrests allow players to finally find chinrests that work for-rather than against-them. 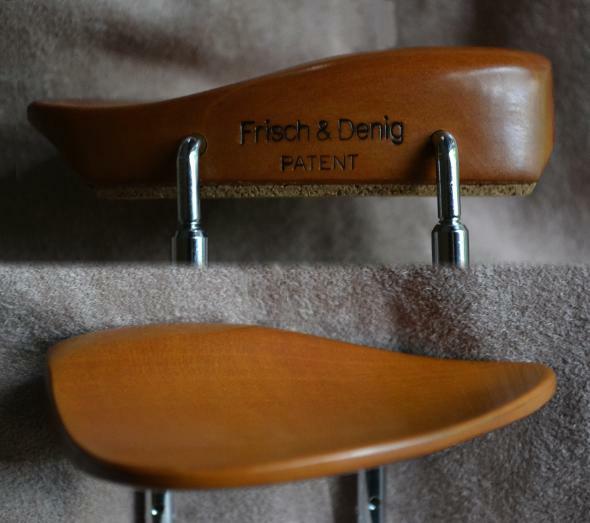 Lifted chinrests are hand crafted by Gary Frisch. 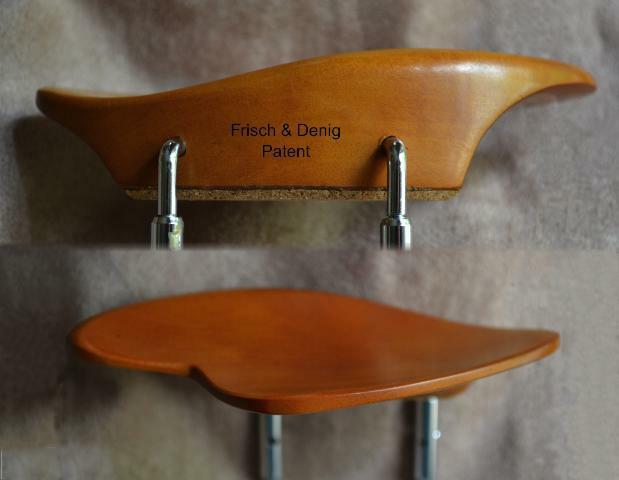 Please find below photos and descriptions of each chinrest shape offered by Frisch and Denig. These chinrests are Brandt, Donaldson, Dresden, Gordon, Hamburg, Kreisler, Original Flesch, Rondo, Strobel, Teka, and Turner. As they appear below, they are in non-lifted versions. This link will take you to examples of lifted chinrests. Click woods used for a description of wood types used for our chinrests. 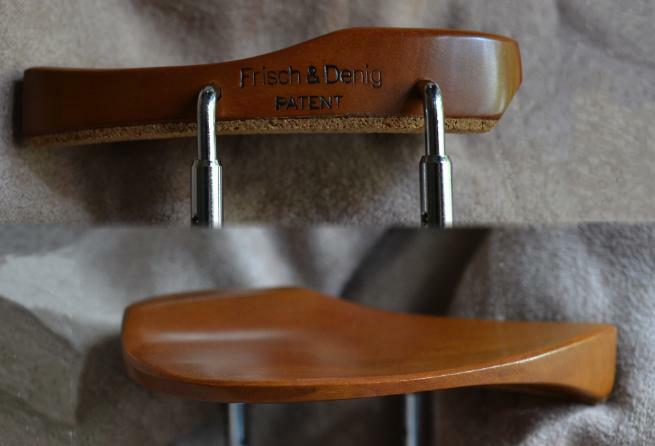 To find a person in your area to fit you with a Frisch and Denig Chinrest, please click here. chinrest fitting 30% of all those fitted by us. The wood here is boxwood. Donaldson's very prominent "hill" and deep "valley"
and whose chins are prominent. The wood here is boxwood. chins are rather broad. The wood here is ebony. deeper. The wood is ebony. whose jaw is long. The wood here is boxwood. as one suiting people with fleshy, non-protruding chins. a chin that is well behind the lower lip. The wood here is rosewood. contour (a dip) for their left jaw bone. 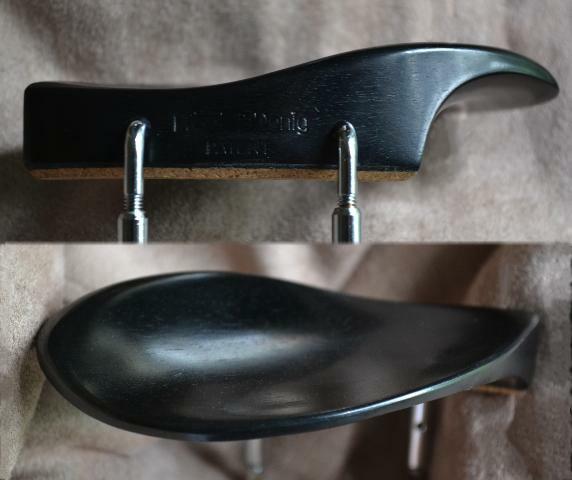 over the tailpiece provides support the chin. a particularly receding chin or a particularly prominent chin. The wood here is ebony. particularly long nor angular and who have fleshier jaws. this chinrest tends to fit U-shaped jawlines. and made of boxwood, was crafted by Gary Frisch. with a rosewood lift. Crafting done by Gary Frisch. 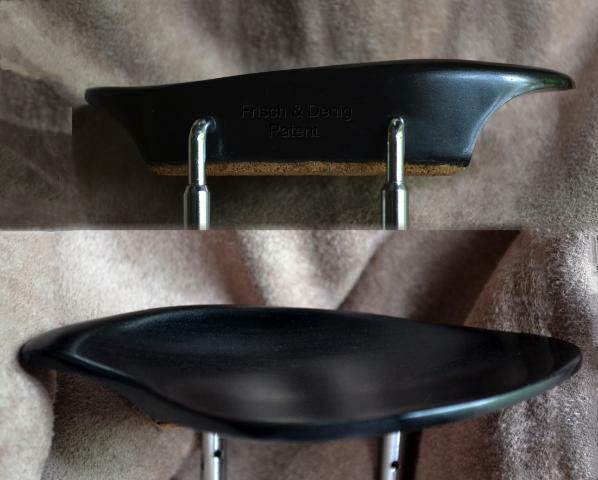 and ebony foot crafted by Gary Frisch. The height of the lift is 15 mm. 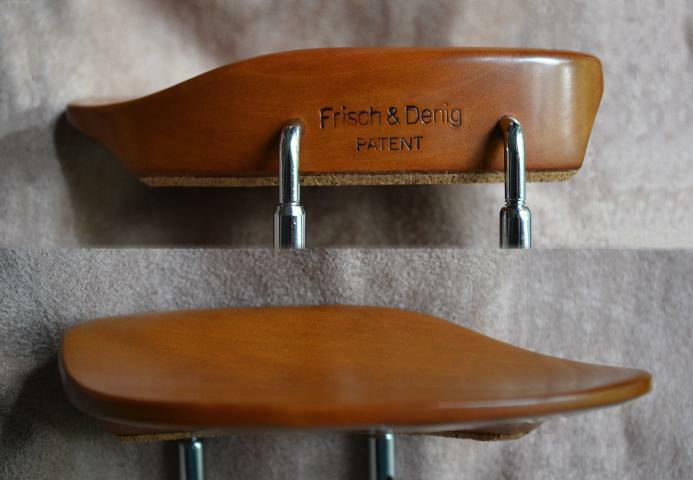 Frisch and Denig chinrests are made of boxwood (light brown wood-see Hamburg, Gordon etc. above), ebony (black-see the Dresden etc. above), or rosewood (dark brown with black stripes-see the Kreisler above). The wood that causes the fewest allergic reactions for those who have sensitive skin is boxwood. Rosewood, despite being quite beautiful, is most often cited for causing allergic reactions in those whose skin is sensitive or who have other skin allergies. In such cases, rosewood is best avoided. As for weight, boxwood is the lightest (30% the weight of ebony) and ebony, the heaviest. If weight is a concern, please choose boxwood. The wood one chooses is typically the same wood as the other fittings (pegs and tailpiece) on the instrument. 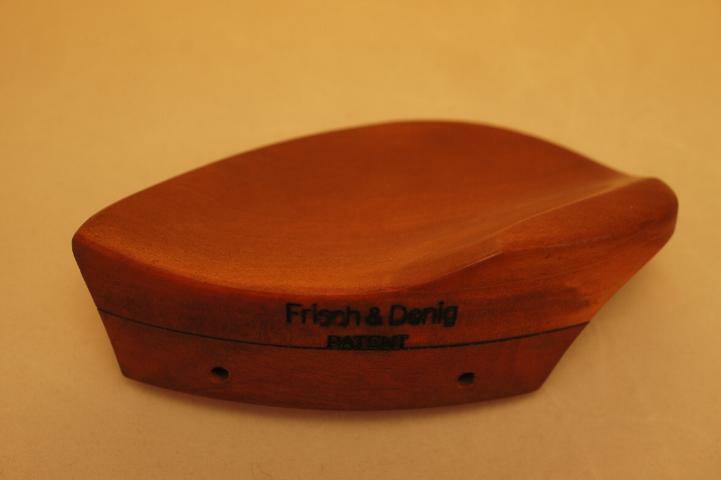 In other words, if your fittings are boxwood (orange), then you might choose a boxwood chinrest. You will observe, though, in players around you that many people actually do choose other colors. In the end, it is a personal choice. 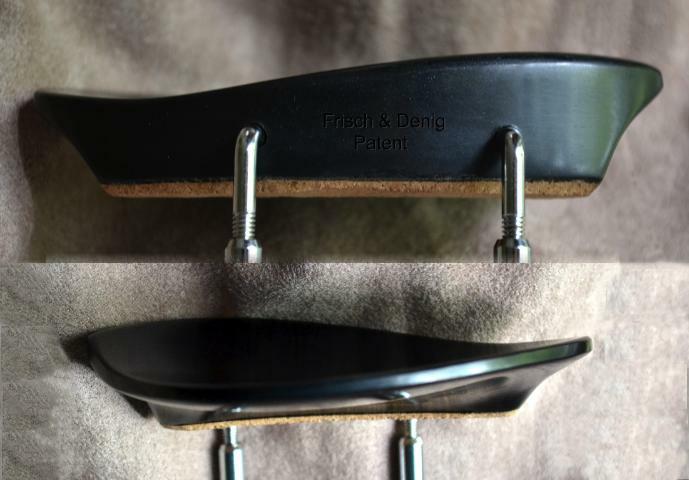 Recognizing that nickel-plated hardware is a problem for players with sensitive skin, Frisch and Denig can fit your chinrest with hypoallergenic fittings for a slightly greater charge. See the Rondo above for an example of this hardware. 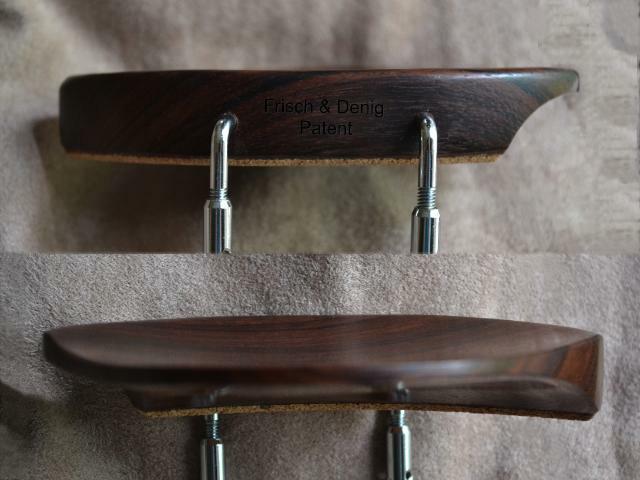 Please contact Gary Frisch under Contact Us to arrange for such hardware for your chinrest. 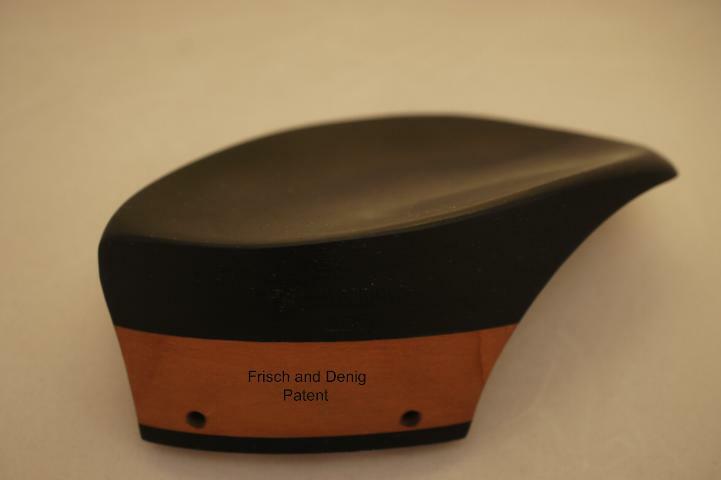 Players who have opted for a lifted chinrest of about 20 mm or above will want to be aware that some violin and viola cases will not close because of the height of their new chinrest. This means that the player must be sure to have a case that will accommodate a tall chinrest, make a small modification to their case or, using a chinrest key, put the chinrest on each time before playing and take it off when finished playing. 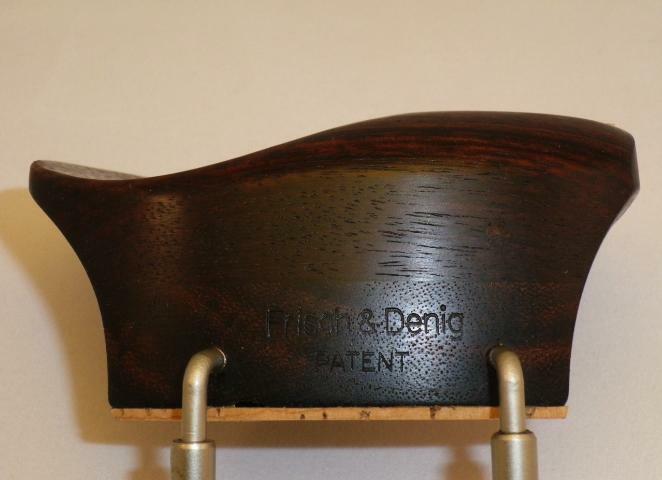 Players who have molded cases (those in the shape of a violin or viola, especially those with the aluminum flange around lid and bottom edge) will not have much leeway to accommodate a lifted chinrest of any height when closing the lid. Please note: Never force the lid of the case closed. 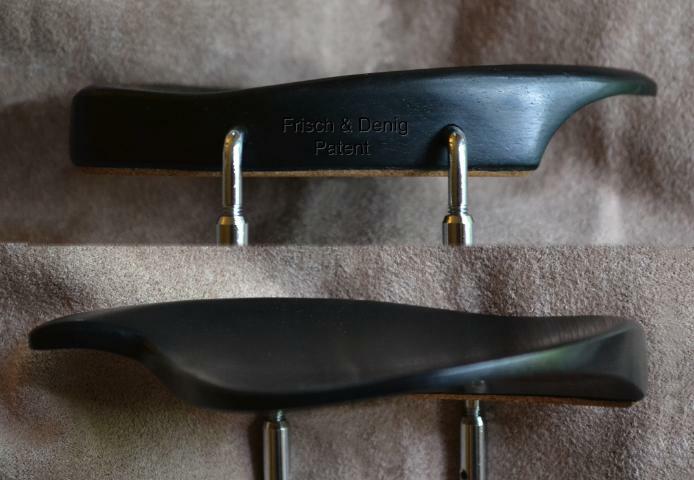 Frisch and Denig take no responsibility for instrument damage due to forcing a case lid closed.